Rita Ora, Jake Bugg and Liam Gallagher have kicked off the action at this year’s Glastonbury Festival, as the sun dries up the mud-strewn fields. Liam Gallagher’s band Beady Eye were the surprise opening act on The Other Stage with a raucous set at 11:00 BST. “It’s never too early for a bit of rock’n’roll aggro, is it?” asked Liam Gallagher, as his band launched into Oasis hit Morning Glory. Other acts playing on Friday include Chic and headliners The Arctic Monkeys. After a day of rain, the clouds broke around midday, apparently conjured up by the sun-bleached rock of US sibling trio Haim. By the end of their set, raincoats were being traded for suncream. About 180,000 fans have gathered at the 900-acre Worthy farm for the festival, which has been largely peaceful so far, with 107 reported crimes and 61 arrests. Somerset police say there have also been 32 drug related offences reported, 12 of which were for possession of restricted substances. Liam Gallagher’s early morning set was something of a turnaround for the former Oasis frontman, who previously headlined the festival in 1995 and 2004. The latter appearance was not well-received, and Gallagher later claimed the festival was “full of idiots”. 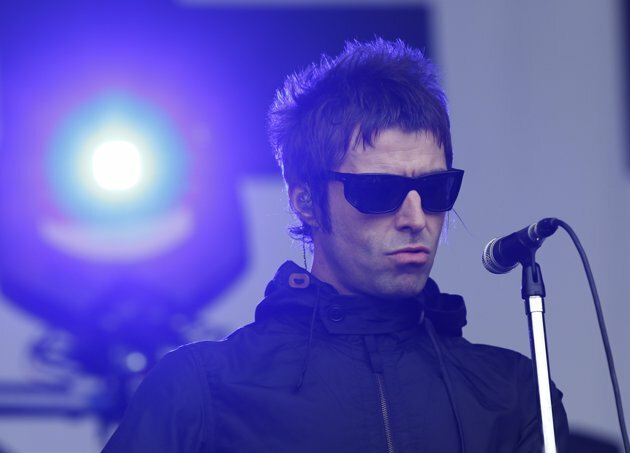 After Friday’s performance, Liam Gallagher said that playing such an early starting time on the Friday morning had been something of a surprise. “Someone just asked us – do you fancy going on at 11 o’clock, and we thought, why not? We’ve headlined it, we’ve done all that. It’s time to do something different. The main stage features a mixture of rap and rock for the rest of Friday, with Professor Green and Dizzee Rascal cosying up to The Vaccines and the Arctic Monkeys. Professor Green, 29, whose hits include Read All About It and the INXS-based I Need You Tonight added: “There’s more to me than that, and I think this is the best opportunity to show that to people. Rumors of “secret appearances” are always rife at Glastonbury, and this year’s crop range from the likely (Fatboy Slim and Radiohead’s Thom Yorke) to the fanciful (Daft Punk and David Bowie). Definitely confirmed for the weekend are co-headliners Mumford and Sons and The Rolling Stones.